Cap up to 12 cm, at first hemispherical, later convex to flattened, colour very variable, yellowish ochraceous, ochraceous, pale to dark brown or brick coloured, often with olivaceous tint, sometimes entirely olive green coloured, dry, felty, sometimes cracking and yellowish or whitish flesh is then seen in the cracks. 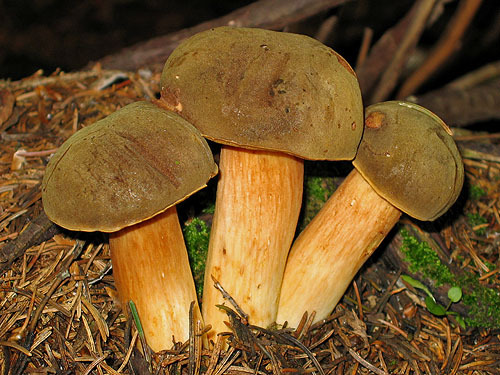 Stipe cylindrical or spindle-shaped, tapered towards the base, pale yellow or yellow, sometimes becoming brownish or rusty, sometimes striate, often covered with scattered fine brownish granules, sometimes forming dotted network, unchanging when bruised; basal mycelium lemon yellow. 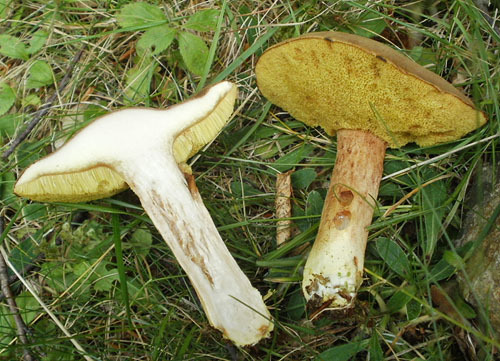 Tubes pale yellow to yellow, more olivaceous with age, blueing or not blueing when injured. Pores concolorous with the tubes, blueing or not when bruised. 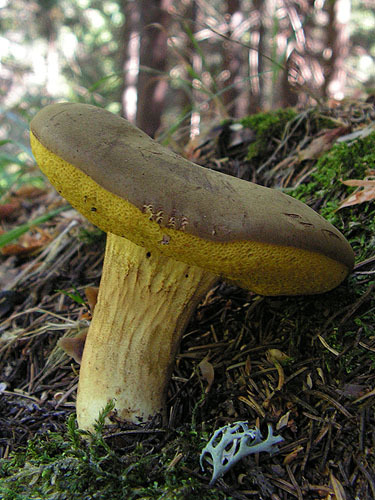 Flesh white, sometimes yellowish above the tubes and in the stipe base, unchanging when exposed to air. Smell not distinctive. Taste slightly acid. Spores 10–16.5 × 4–6 μm, smooth. Pileipellis trichoderm of septate hyphae of cylindrical, smooth or nearly smooth cells. Habitat. Mainly in coniferous or mixed forests, mycorrhizal mostly with spruce (Picea), but also with beech (Fagus), birch (Betula), bearberry (Arctostaphyllos) or dwarf willows (Salix herbacea, S. repens). Distribution. In Europe widespread, but out of any doubt in the past confused with Xerocomus subtomentosus. Similarity. 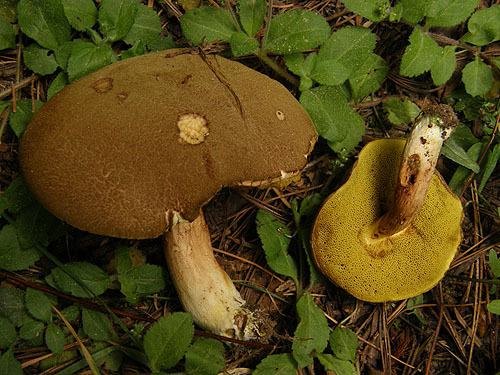 Xerocomus ferrugineus is most similar to Xerocomus subtomentosus, but the later has pinkish to pinkish brown flesh in the stipe base, that is usually blueing in the cap. 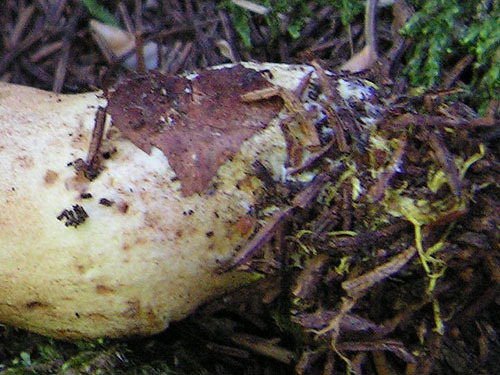 The basal mycelium in Xerocomus subtomentosus is whitish instead of the striking lemon yellow mycelium of X. ferrugineus. Gelardi, M. 2011. A noteworthy British collection of Xerocomus silwoodensis and a comparative overview on the European species of X. subtomentosus complex. – Bolletino dell’ Associazione Micologica ed Ecologica Romana 84: 28–38.